Each room has individual features and character, but we do have a couple of larger rooms which are perfect for longer stays or when you need some extra space. Please ask for more information when you make your reservation. When you’ve explored to your heart’s content, you can flop on to the comfiest of beds in one of 14 rooms. The wonderful rustic furniture which adorns each of the rooms and has been part of the Inn for as long as we can remember – of course, we’ve lovingly restored each piece and given it a bit of TLC. We love our food here at The Golden Lion and we hope that you will too. 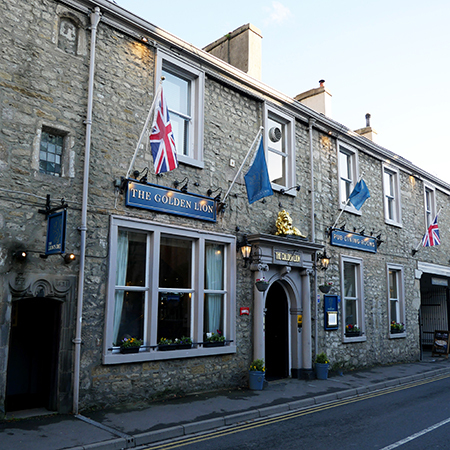 Choose from menus which have been created to showcase the best local in season produce, sourced from trusted suppliers throughout Settle and the surrounding area. We believe that with great quality ingredients you don’t have to try too hard, which is why dishes here are simple, but beautifully executed by chef and his team. The aroma of freshly prepared home cooking will fill the air as you’re tempted by everything from a hearty Yorkshire breakfast right through to delicious Sunday roasts. And we’re sure the new Deli Boards will be a really big hit with you – they’re simply presented wooden boards with a little bit of everything from our Butcher, Fishmonger or Gardener’s choice. We’re blessed to have our very own craft brewery in Lancashire, where our parent company, Daniel Thwaites, has been brewing beer since 1807. As you would expect, we’ve learnt a thing or two about what makes a perfect pint over the years and we’re proud to be able to offer you cask ales that are exclusive to our Thwaites pubs, inns and hotels. Each month the brewers will create up to five different beers, balancing flavours profiles and strength, to create some really fantastic beers that our customers love to drink.